When browsing Facebook I stumbled upon a recipe called “Unicorn Dip” so of course I was ALL OVER that. I just needed the right time to test the recipe. Given that the dip uses a rainbow of colors, I felt like I could apply it to a St. Patrick’s Day treat. I used this recipe from Delish. Overall the recipe is easy, there aren’t too many ingredients and I had most of the items already in my pantry. Things were going super great until the food coloring. Let’s just say the blue food coloring squired all over me and the cup (which I didn’t know until I picked it up). It’s been 24 hours and my hands are still a bit blue. Soap and water didn’t help and the internet suggested rubbing alcohol and that was useless. I tried hand sanitiser and surprisingly The Honest Company variety worked better than non-organic stuff. I’m now down to pastel blue spots. Hoping that shampoo helps. (The internet also suggested bleach! And nail polish remover). Delish suggests layering in the colors and then swirling with a knife. Using bold colors didn’t pay off here because they turned a little brownish. If I do this again, I’ll keep the colors a pastel and not use the multi-colored sprinkles. Excuse the ugly plastic container here, but I wanted to use something that could show how the colors layer in. 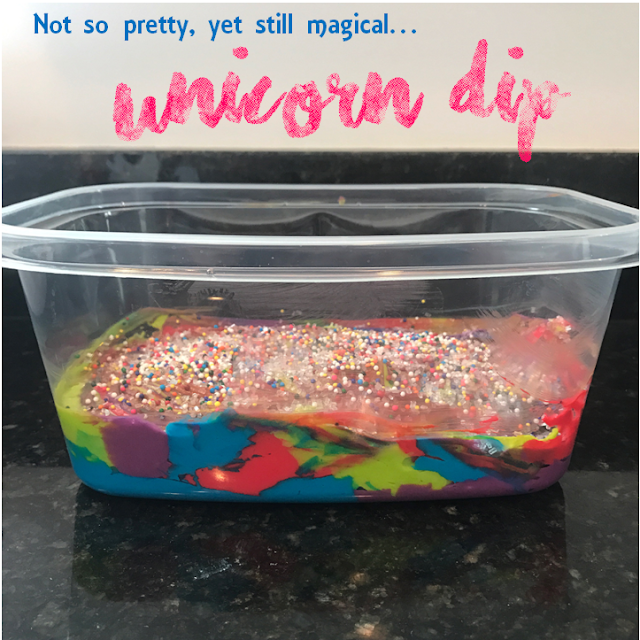 While my unicorn dip may not be the prettiest, IT IS SO GOOD. The recipe is a keeper with some modifications! In a large bowl, combine cream cheese, marshmallow fluff and powdered sugar. Beat with a hand mixer until evenly combined. Add heavy cream, vanilla and salt. Beat until smooth and fluffy. Divide mixture between four small bowl (or one bowl for each color you're using) and add a couple drops of a different food coloring to each bowl. Stir to combine, adjusting color as desired. Add spoonfuls of the dyed dip into a serving bowl, alternating colors until you’ve used up all the mixture. Swirl the colors together with a knife. Top with sprinkles and serve with graham crackers.